No 2: Some of the greatest buildings encourage you to focus elsewhere, away from the building itself. St Mark, Bjorkhagen, Stockholm. 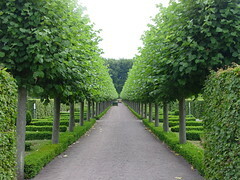 Sigurd Lewerentz. St Mark, Bjorkhagen. Through the birch wood. 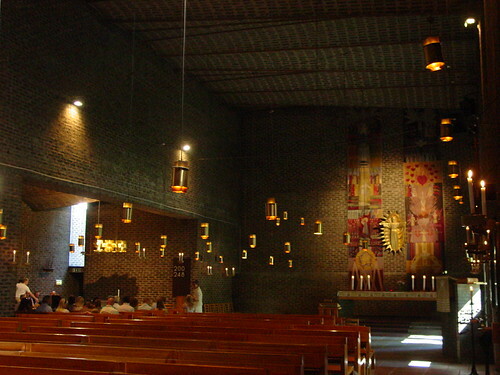 St Mark is one of two brown brick churches completed by this architect in the ’50s and ’60s (the other is St Peter’s, Klippan). 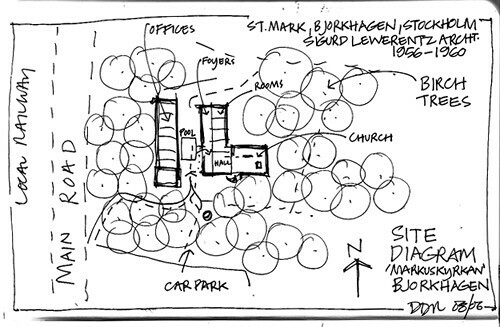 Like St Peter’s it is a precise geometric composition of church, parish offices, social rooms and courtyard. 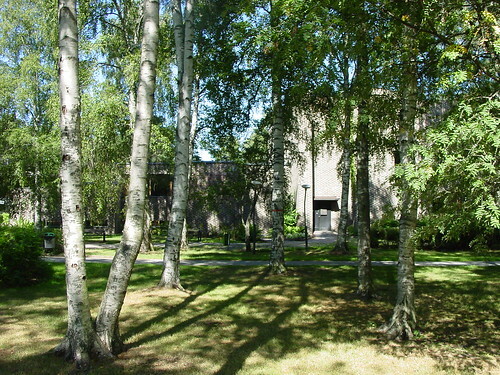 Set in a birch wood separated from the unremarkable suburban apartments nearby, there is no sense of the building contributing to the immediate urban area in any conventional way. 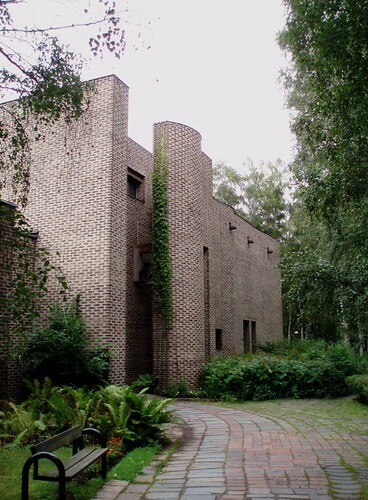 The architect establishes a detached environment within the birch grove, creating a sense of place which might have existed before the arrival of the suburb. 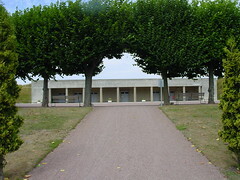 The church buildings enclose a courtyard oriented north/south. 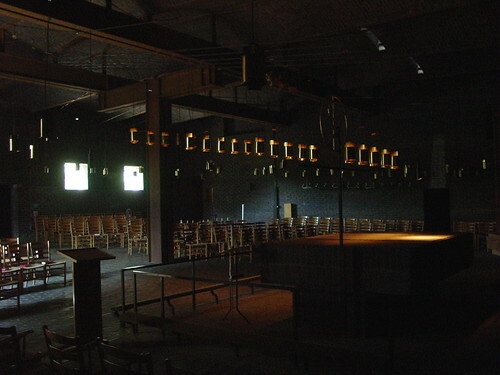 The church itself is oriented in the traditional way but it is difficult to identify the nave within the massing of the building. The building achieves a reorientation of the visitor in time, position and atmosphere. South facade. Courtyard central; offices left; church and social rooms right. Bells in the undulating section of wall. 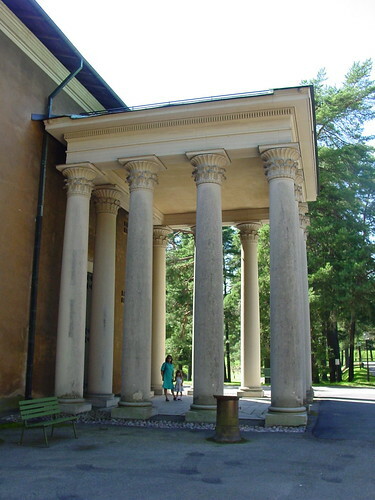 A timber portico (detached as at the Resurrection Chapel) watches over the courtyard and marks the entrance to the church. 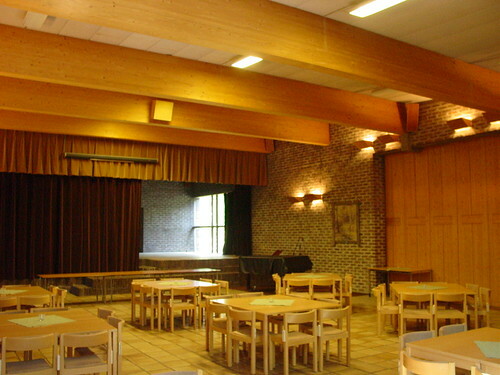 The church itself is entered through a foyer followed by a public hall. This succession appears to be inspired by the processional sequence in early-Christian churches. 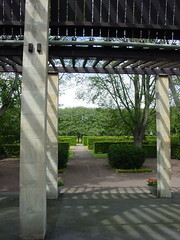 The route from the from the courtyard is a progression from daylight to darkness. As you enter it is difficult to make out the features in the nave. It takes time to adjust and accept the new condition. A baptism is in progress. It is as dark as an underground space: a crypt or catacomb. An architect from Jerusalem also visiting the church that day attempted to explain it to me: “This is the work of a master. The use of light is masterful. In the darkness our eyes search for the light. We must wait for the light to be revealed to us.” A single window high-up on the south side of the nave allows a shaft of light to pick out a small piece of the nave floor. The ceremony continues. The bells ring. The baptised child is raised up and shown to the congregation. Church of St Peter, Klippan, Sweden. 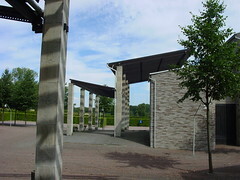 Sigurd Lewerentz 1963-1966. Photoset. Yes, it’s dark in there. 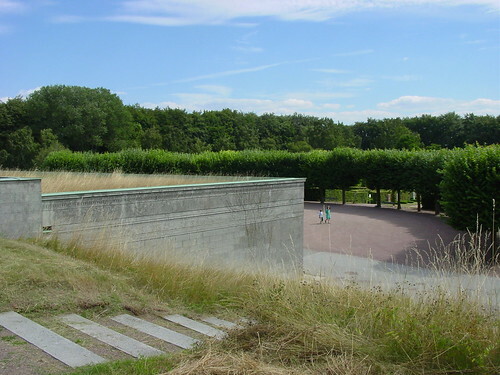 Sigurd Lewerentz worked on the Malmo Eastern Cemetery from 1916 until 1969. 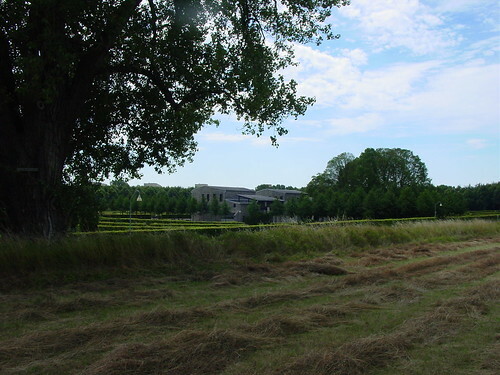 The cemetery is the site of his final building. 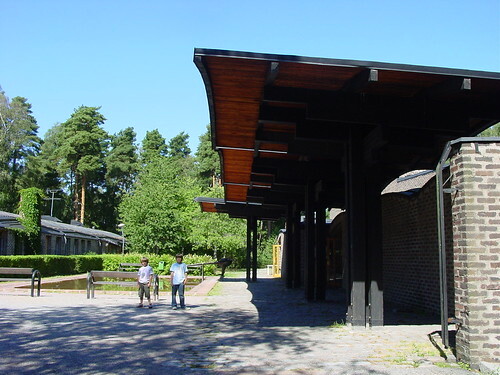 The first impression of the cemetery is disappointing – the initial impact of the Woodland Cemetery in Stockholm is so complete that you expect the trick to be repeated. It takes some time to understand the structure of the landscape design and appreciate the architect’s mastery of topography. His winning competition design was entitled ‘The Ridge’ and it is structured in relation to an existing ridge running across the site. 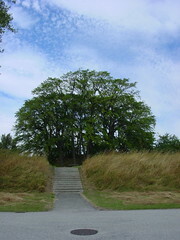 The ridge incorporates a Bronze Age burial mound. Lewerentz treats the ridge as a long stretch of “captured” arable land, an excerpt from the Scanian countryside. He specified that it should be planted with wheat. 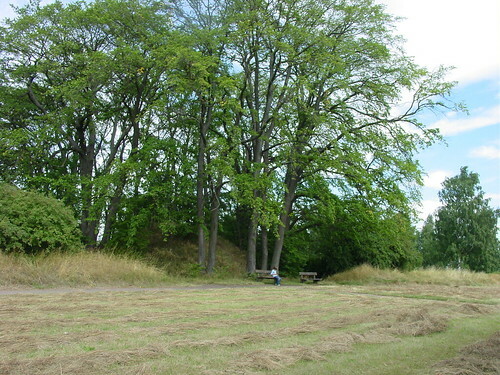 The ridge allows a wider view of the whole site and is intended as a place for reflection, a short walk perhaps, after the burial ceremony. The architect’s ashes are scattered here. 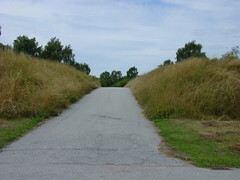 The ridge is crossed by paths and steps leading to the formally hedged enclosures containing graves on the slope below. Lewerentz contrasts the treatment of the ridge as countryside with the formal grid of the enclosures which follow local burial practice. 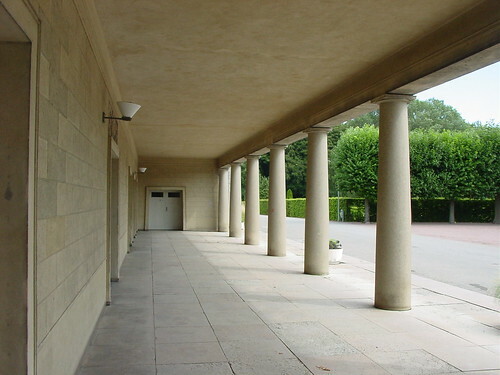 The cemetery buildings mark the phases of Lewerentz’s architectural expression between 1916 and 1969. From neoclassicism to a free, experimental use of materials in their crudest form. All the buildings are difficult in their obtuseness and their refusal to ingratiate. 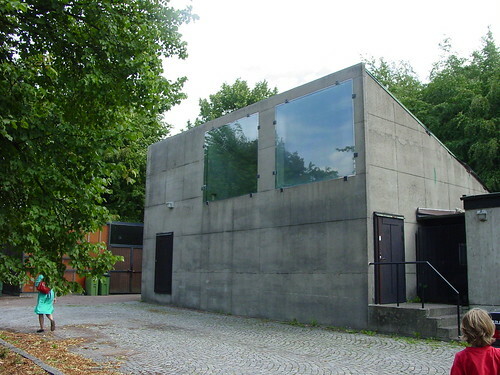 The first building completed on the site was The Chapel of St Birgitta. 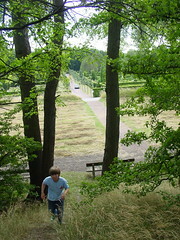 It is set into the ridge, supporting the primacy of the landscape feature. The building is painfully severe and mute. 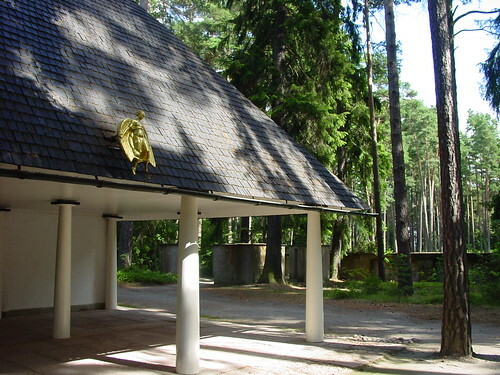 The Chapel is related to an axis through the formal burial areas. Further down the slope are the Chapels of St Knut and St Gertrud, completed in 1943. These have monopitch-roofed loggias and walls made of marble chips laid in courses. The buildings appear ungainly. Caroline Constant proposes that the buildings have “affinities with Scanian farms, the tree-lined complex offers a requisite sense of privacy while insuring the visual dominance of the landscape”*. 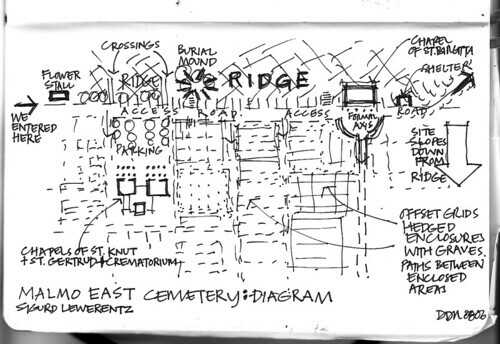 The view from the ridge across the burial enclosures supports this interpretation of the buildings as related to an unselfconscious local vernacular. The flower stall of 1969 continues the monopitch theme which can perhaps be traced back to the land form as it gently slopes from its origin, the ridge. 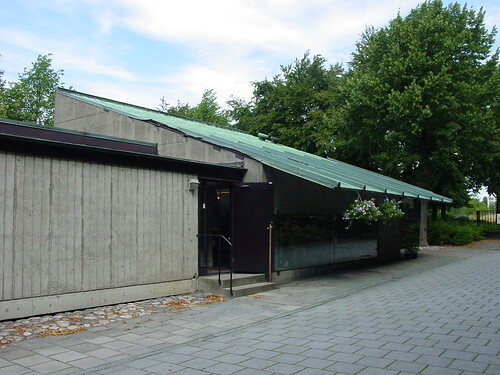 The open competition for the design of an extension to Asplund’s Stockholm City Library is still open for registrations (Swedish Association of Architects, free registration). The information for competitors is excellent, particularly the competition brief pdf which contains drawings, photographs and historical information. DWG files of the site are included for CAD users. Even if you decide not to enter, the competitor’s pack is worth studying. The closing date for the first stage of the competition is 27 October 2006. Lettering. 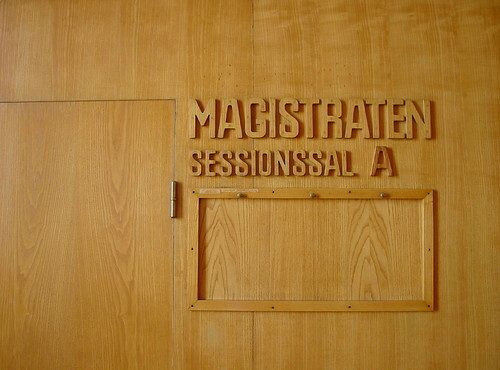 Gothenburg Law Courts. 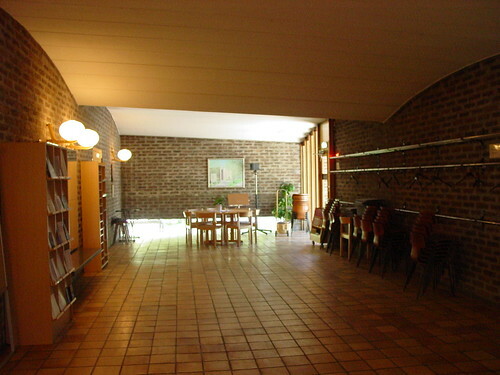 Architect: Erik Gunnar Asplund, 1937. Photoset. 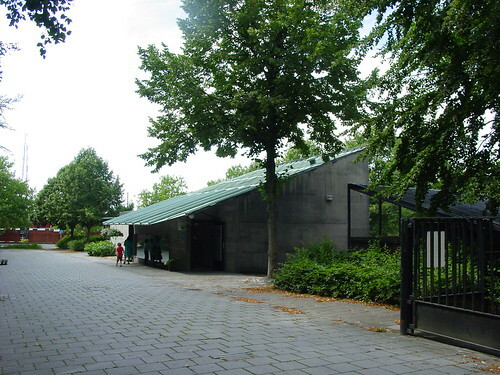 The final building by Sigurd Lewerentz is a small flower stall completed in 1969 for Malmo East Cemetery. The original simple mono-pitch form has been recently extended. 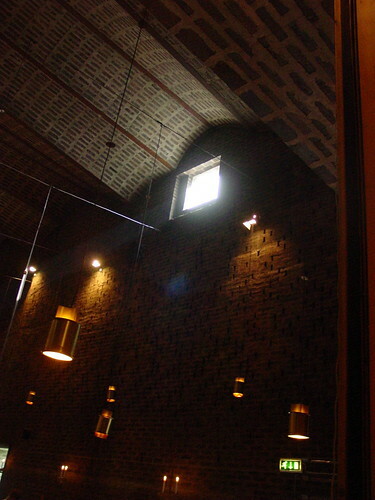 The original building is charming and elegant. 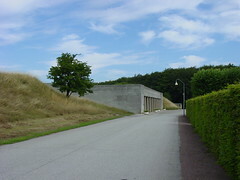 It is sited parallel with the ridge along the site and has concrete walls and a copper-covered roof. The windows are clipped to the face of the walls and finished with sealant. The roof sweeps down to shade the front window. The timber battens, intended primarily for the jointing of the copper sheet, are thickened to provide structure for the roof overhang. The surface-fixing of the glass conceals the thickness of the concrete walls and gives the whole structure a feeling of surface, thinness, lightness. It is difficult to get a new angle on this classic building. The biggest surprise, to me, is its aloofness – the building stands back four-square, the main approach to the entrance obscured by commercial structures along the street. 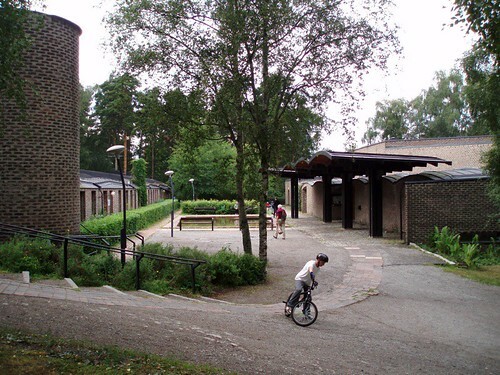 This must be intentional as the base formed by shops and restaurants was part of Asplund’s scheme. His original drawing shows a commercial terrace with clean lines and elegant typography. He cannot have dreamed of the signage inflicted upon the scene by McDonalds. As the axial entrance appears and you climb towards the building you are drawn into an introverted cylinder of books at the centre of an architectural mountain complementary to the adjacent hill. Lewerentz. Chapel of the Resurrection, Woodland Cemetery. Photoset.